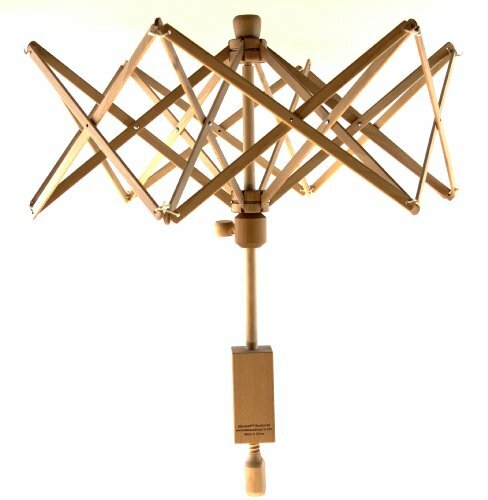 Based on antique barrel yarn winders and bamboo swifts found in Japan, the Schacht Goko Metal Swift makes it easy to wind yarn in no time. This swift is a true work of art – a cross between a water wheel and a carnival ride in appearance. But what we like the most is how well it performs and how long it lasts. In this review of the Schacht Goko Metal Swift, we’ll take a deep dive into what makes this yarn swift unique. We’ll cover its durability, performance, what we like and dislike, and what you need to know before you buy. Created during the 1970’s back-to-the-land movement, Schacht Spindle Company began operations making spindles and weaving looms. Fast forward to the early 2000’s to find Schacht making an innovative swift that meets the needs of not only hand spinners, but knitters and crocheters as well. 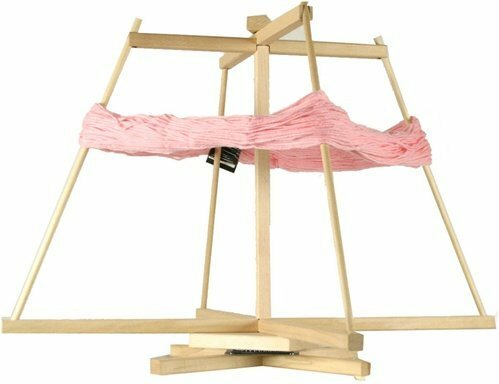 This unconventional looking yarn swift spins on a vertical axis. Many users find yarn pulls off the swift more quickly and smoothly when a swift spins vertically. When yarn sits on a horizontal swift, the yarn falls down causing it to overlap and tangle. More tension also is needed to hoId the yarn hank in place, which places stress on the yarn. That’s what makes this vertical swift stand out. Not only does it need less tension, but the yarn stays in place naturally while the wheel spins smoothly. You also need to turn the wheel less as you wind your yarn. What Can This Yarn Swift do for You? Wood and metal come together to create the unique design of this swift. Easy to assemble using a screwdriver and the included screws, the wooden base sits on a table or the floor with two wooden arms extending upward. The hub of the aluminum wheel fits into slots on the upward extending wooden arms of the base. 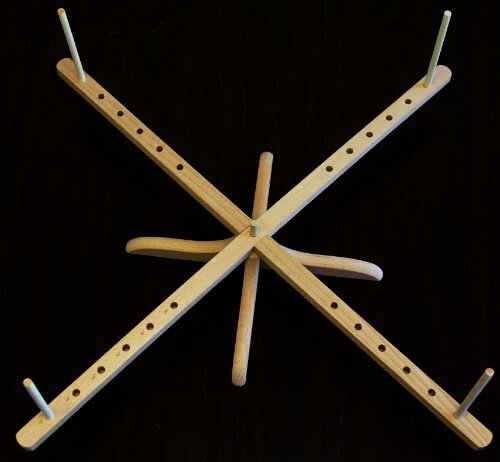 The cross piece that holds the two sides of a strut together has a crimp, which holds the yarn in place. 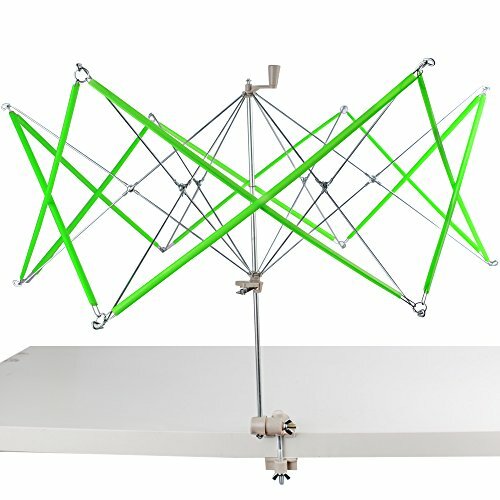 Hank size: This swift adjusts to hold hanks from 57 inches to 64 inches by turning a plastic knob on the hub of the wheel and then by turning the hub. 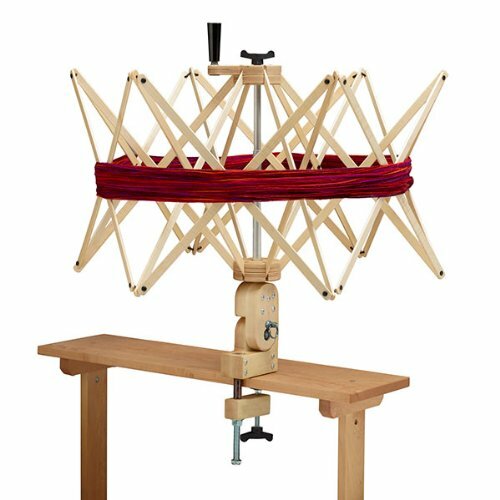 If you enjoy spinning your own yarn, this swift makes it easy to create hanks of the same diameter. 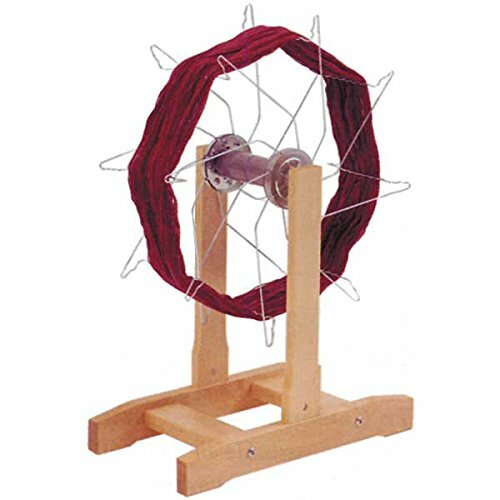 Simply attach one end of spun yarn to a spoke and turn the wheel. You’ll have perfectly sized yarn hanks in no time. Many people also use this swift to unwind yarn cakes or balls at the end of a project. This removes the tension on the yarn and allows it to rest until another project comes along. Storage space: Although the wheel on the Goko doesn’t collapse, you can remove it from the base and take the base apart for storage. Many people leave this swift out in their workspace as a conversation starter or just because they like how it looks. Why keep something so interesting hidden away? Most often used for lightweight yarns including silk, this metal swift works well with heavier weight yarns too. With no wooden splinters to catch yarn, fiber types with halo such as angora or mohair stay intact. Additionally, the vertical motion of this swift means less tension occurs when using a ball winder. Less tightly wound cakes or balls retain even the softest yarn’s loft. The varnished hardwood base provides a strong steady support for the metal wheel. As most users leave this swift out on display for ease of use, the screws in the wooden base remain in place. This keeps the wood from stripping when removing screws and the screws tight when in place. Some swifts rotate with wood touching wood, which can cause an irritating squeaking noise. The Goko’s metal wheel rotates in a slot at the top of the wooden base without producing noise. Rough handling of the metal wheel could bend the struts. But with care, this swift should provide knitters an enjoyable experience for a long time. At 6 pounds, the portability of this easy-to-assemble swift gets you in position to wind hanks into balls quickly. We appreciate the quality and artisanship in this unique yarn swift. The well-balanced heavy-duty wooden base easily supports the metal wheel. If you have limited space for a horizontal style umbrella swift, this swift may be a better fit for you because it takes up less room when in use. If you want a whimsical art piece that does double duty as your yarn swift, the Schacht Goko Metal Swift does just that. Collapsible plastic and metal umbrella swift clamps onto table. Lightweight yarns may get caught on metal hooks at end of ribs. Hand crafters appreciate the fast smooth spinning. Diagonally placed arms take guesswork out of placing yarn. People enjoy the how small this swift is when collapsed for storage. Wood-on-wood rotation finds users reaching for wax and oil to stop the noise. Easy to assemble and disassemble traditional tabletop swift. Slower rotating swift may move when using a ball winder causing uneven yarn tension. Clamp on umbrella swift rotates to a vertical swift, allowing it to be used both horizontally and vertically. Traditional umbrella style includes yardage counter.